It is often the case that traditional things, ways, solutions serve as foundation for the new, the out-of-the-box, the fresh, and unexpected. I was just going through a book I received for review and was struck by how many amazing quilts we can create if only we would forget for a little while the 'right' way to sew a block, to cut a line, to assemble a project. 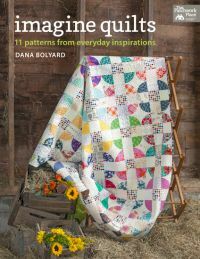 Imagine Quilts by Dana Bolyard not only features beautiful modern projects, but it also helps you look for inspiration in your fabric stash, around your surroundings, break the rules, and make delightful quilts. In her creative process, Dana uses "scale drawings, scribbled mathematical computations, colored pencils, graph paper... and lots of head scratching...". The result, in this book, is a collection of 11 patterns which are very easy to make. She does all the hard work, and we just have to follow the clear instructions and diagrams. Works for me! Dresden plates, rectangles with strategically placed lines, foundation piecing, and plain old squares arranged in new ways and modern designs ensure you won't look at things around you the same way. Imagine Quilts is a great addition to my quilting library. Now, I must finish school work so I can find time to work on the "Zip It" quilt (not shown), which I REALLY love!